The American Board of Surgery (ABS) is an independent, non-profit organization founded in 1937 for the purpose of certifying surgeons who have met a defined standard of education, training and knowledge. Surgeons certified by the ABS, known as diplomates, have completed a minimum of five years of surgical training and successfully completed a thorough written and oral examination process. Dr. Mayfield became a diplomate of the American Board of Surgery in 1990. Established in 1937, the mission the American Board of Plastic Surgery (ABPS) is to promote safe, ethical, efficacious plastic surgery to the public by maintaining high standards for the education, examination, certification and recertification of plastic surgeons as specialists and subspecialists. At least two to three years of plastic surgery training is required during or following a five to six year postgraduate residency program, followed by a comprehensive and rigorous set of written and oral examinations that must be completed successfully, to become a diplomate of the ABPS. The American Board of Plastic Surgery is the only plastic surgery specialty board recognized by the American Board of Medical Specialties to credential plastic surgeons. 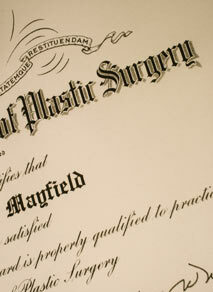 Dr. Mayfield became a diplomate of the American Board of Plastic Surgery in 1992. This certificate is awarded to board certified surgeons who have demonstrated qualifications in Hand Surgery that deserve special recognition having passed a written examination administered by the American Board of Plastic Surgery. Dr. Mayfield earned the Certificate of Added Qualifications in Hand Surgery, awarded by the American Board of Plastic Surgery, in 1994. The American Society of Plastic Surgeons (ASPS) is the largest plastic surgery specialty organization in the world. Founded in l93l, the society is composed entirely of board certified plastic surgeons that perform cosmetic and reconstructive surgery. The mission of ASPS is to advance quality care to plastic surgery patients by encouraging high standards of training, ethics, physician practice and research in plastic surgery. The society advocates for patient safety, such as requiring its members to operate in accredited surgical facilities that have passed rigorous external review of equipment and staffing. To maintain membership in the ASPS, members must adhere to a strict code of ethics and participate in continuing education. The American College of Surgeons is a scientific and educational association of surgeons that was founded in 1913 to improve the quality of care for the surgical patient by setting high standards for surgical education and practice. Members of the American College of Surgeons are referred to as "Fellows." The letters F.A.C.S. (Fellow, American College of Surgeons) after a surgeon's name signify that the surgeon's education and training, professional qualifications, surgical competence, and ethical conduct have passed a rigorous evaluation, and have been found to be consistent with the high standards established and demanded by the College. Founded in 1948, as the educational and research arm of the American Society of Plastic Surgeons, the Plastic Surgery Educational Foundation's mission is to develop and support the domestic and international education, research and public service activities of plastic surgeons. Founded in 1970, the American Association for Hand Surgery has grown to over 1100 surgeons and other health professionals who care for patients with hand and upper extremity problems. Election to membership is based upon training, board certification, scientific and professional accomplishment, and the degree of active interest and experience in the disciplines related to hand surgery. Alpha Omega Alpha, commonly referred to as AΩA, can be thought of as the "Phi Beta Kappa for medical schools." As the only national honor medical society, its mission, developed over the past one hundred years, has been to recognize and enhance professionalism, academic excellence, service, and leadership within the profession. One basic premise of the Society is that election to A?A is not only a capstone of a student's medical school career, but an obligation in his or her own personal life as a physician to support the principled ideals set forth so effectively and lastingly by the founders of the organization. Founded in 1853, the Butler County Medical Society is a nonprofit professional association of physicians who practice in Butler County, Ohio. The Academy of Medicine of Cincinnati, founded in 1857, is a not-for-profit, professional association for local physicians. The mission of the Academy of Medicine is to advance the practice of medicine and promote optimal health for citizens of Greater Cincinnati through education, advocacy, and communication. The Ohio State Medical Association is a nonprofit, professional organization that represents more than 15,000 of Ohio's physicians, residents and medical school students. The American Medical Association (AMA) is the largest association of medical doctors in the United States. Founded in 1847, the AMA's mission is to maintain high standards of medical education, provide scientific information to medical professionals and health-related information to the public, and develop programs to advance the practice of medicine and to serve the health needs of the public. The AMA also represents physicians and the medical profession in affairs related to government health-care policies. At the beginning of the 21st century more than one-third of all physicians in the United States belonged to the AMA.